CHRIS REEVE KNIVES. Mnandi. Integral lock. 3 9/16" closed. 2 3/4" DEVIN THOMAS STAINLESS BASKETWEAVE DAMASCUS Steel Blade. Ambidextrous thumb slot, notched thumb ramp, phosphor-bronze washers. Titanium rear handle with bead blast integral lock and GABON EBONY Inlay. 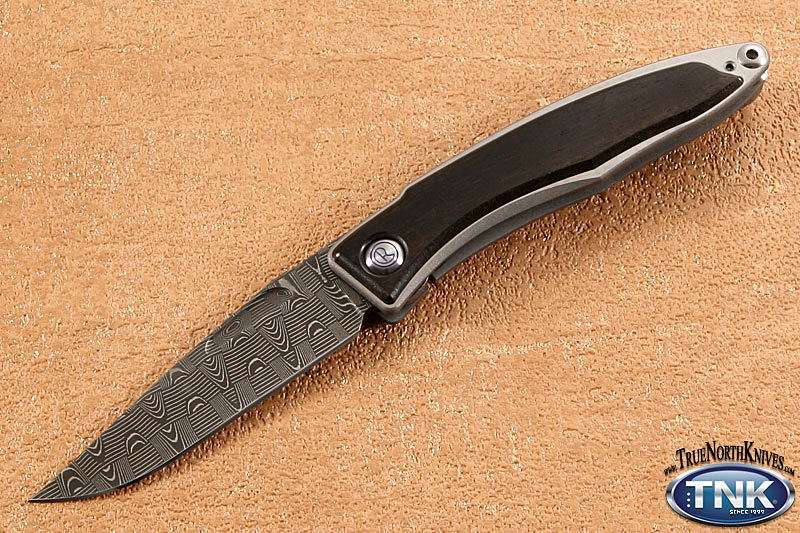 Polished titanium front handle with GABON EBONY Inlay. Titanium pivot cover with logo, stainless pin/pivot and screws, titanium backspacer washer. Titanium pen-style pocket clip.